Emmer & Co. is seeking to revolutionize commercial poultry production. Jesse Solomon believes heritage breeds are the future of chicken production. Solomon launched Emmer & Co. in 2015 with the goal of changing the commercial poultry industry. At first blush, the San Francisco startup follows the same model used in almost all commercial poultry production: Farmers sign a contract to “grow” the chickens—the industry term for raising poultry—earning a fee for each flock while the company owns the chickens and manages all aspects of the supply chain from processing and distribution to sales and marketing. But unlike other “Big Poultry” agreements where chickens are housed in cramped barns, bred for fast growth, raised on vegetarian diets, and sent to slaughter at eight weeks old, Emmer & Co. insists that its birds are raised in small flocks, on pasture, with access to insects and grubs and room to roam. All of the birds in the Emmer & Co. flock are heritage breeds, a term coined by the American Poultry Association to refer to birds whose genetics can be traced back multiple generations. These slow-growing chickens, which include breeds like New Hampshire, Plymouth Rock, and Buff Orpington, don’t reach market weight for at least 16 weeks (or twice as long as standard meat birds, which generally only grow for eight weeks). But it’s still just a drop in the bucket. Currently, farmers under contract with large producers like Tyson Foods and Perdue raise 95 percent of the nation’s meat birds, according to the National Chicken Council. And the combination of heritage breeds and pasture-based farming model comes with its share of challenges. For starters, heritage breeds are harder to find than standard broilers. Frank Reese, a farmer in Kansas who sells up to 500 heritage birds every six weeks through Emmer & Co., works with two additional farmers in the Midwest to raise breeding stock that can be supplied to contracted growers. Tyler Dawley is one of those contracted growers. Dawley started out raising Cornish Cross broilers, the fast-growing breed favored by most poultry producers, on his California farm, Big Bluff Ranch, in 2009. He raised and processed the chickens and sold the meat direct-to-consumer through farmers’ markets and community supported agriculture subscriptions (CSAs). As the popularity of the pasture-raised poultry grew, the farm reached the limit of its processing capabilities, which also limited farm income. Dawley wanted a partner to manage the supply chain, but did not want to transition the farm to a typical production facility complete with climate-controlled chicken houses and cramped quarters for his birds. “I wanted them to be able to express their chicken-ness,” he says, referring to an oft-cited term coined by Joel Salatin of Polyface Farm. Solomon wanted Red Bluff Farm to maintain its pasture-based model, even insisted on it. But Solomon did require one change before signing a contract with the farm: It needed to agree to grow heritage breeds in separate pastures from the Cornish Cross birds. As part of the partnership, Red Bluff Farm now processes up to 600 chickens per week for Emmer & Co. It’s a fraction of the 2,300 Cornish Cross broilers Dawley raises under a contract with a local food service distributor, but he is confident that working with the startup will be instrumental in helping him scale production of heritage breeds—and, in the process—revolutionize poultry production. “Changing the poultry industry is not as quixotic as it sounds,” Dawley says. But that doesn’t mean it’s simple. Beranger believes a startup like Emmer & Co. faces four major barriers to scaling production: Hatcheries are not producing enough certified heritage breeds; growers are often too small to benefit from cost and production efficiencies; independent USDA-certified processing facilities are disappearing; and consumers are used to cheap meat. “It’s going to take time to build a significant enough market for heritage birds for producers to scale,” she says. To date, Emmer & Co. has contracted with four farmers who process nearly 125,000 birds annually under contracts with the startup—with plans to double that number in 2017. Solomon believes that as production increases, the company will be able to negotiate better contracts with processors, warehouses, and fulfillment centers, which will address the other significant challenge: price. Raising heritage birds on pasture is more expensive then packing broilers into chicken houses (where the birds move around less and eat much less feed), which translates into higher prices for consumers. 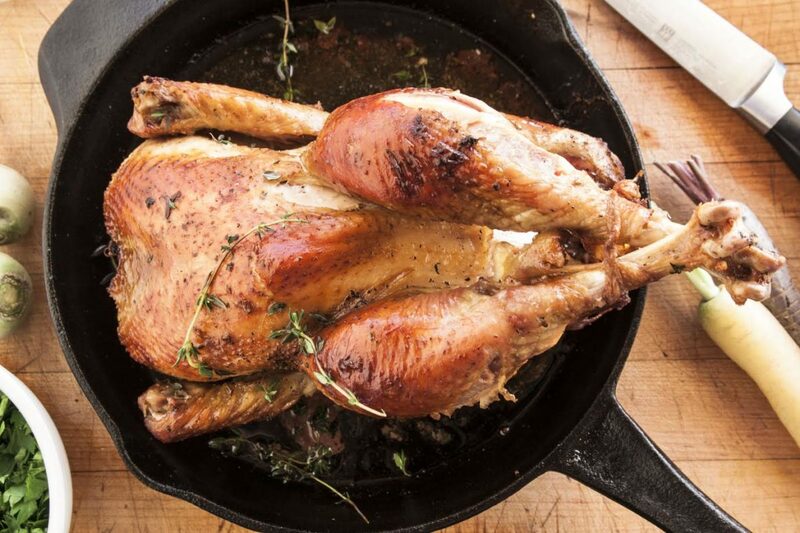 Emmer & Co. sells chickens through online retailers like Vital Choice and Williams Sonoma via its website; whole chickens retail for $44.50—that’s three times what an organic chicken in the grocery store costs. But these higher prices translate to higher wages for farmers. Dawley notes that his gross earnings are less than when Red Bluff Farm sold direct-to-consumer, but the net returns are higher. While it’s still early in the evolution of the model, Solomon—and the growers he contracts with to raise heritage breed birds—have high hopes. As a geneticist, I appreciate the goal of wanting to preserve unique genetics, and the focus on flavor of the resulting meat. As someone who has raised animals on a small scale when I was younger, I also appreciate the emphasis on animal welfare. However, my chief criticism is that this is a boutique food operation for producing food for rich people. You may scoff at the efficiency of modern chicken raising operations, but their efficiency translates into food that people of low income can afford to buy and eat. Using more feed and more land for an exclusive experience for rich people is the foodie elite status quo, not a revolution for the masses. Suggestion: Breed new chickens for both flavor and efficiency. Not exclusive concepts! I'm not wealthy, but I'm all in, and have no problem returning to my childhood's tradition of Sunday chicken dinner, when chicken was too expensive to serve as a daily staple. Even our poor in this country are spoiled by cheap food. Chickens as meat have always been elitist - owning to their dependence on grain. It is only in our current era of subsidized fossil fuels and government supported commodity agriculture that they have become a common indulgence. Rather than breeding chickens so we can all eat like kings we'd be better off to create ecological farms where good foraging birds can thrive with fewer inputs and dependencies.